I know, I know. Yesterday was Valentine’s Day and how could you possible want more chocolate in your life? Well, I meant to post this ON Valentine’s Day but thing got busy (I’m sure you can relate). These little bites were my V-day gift to Wyatt. We play this little devilish game – we both WANT to eat fresh and organic but have our vices. Mine are those little booty puff popcorn things…do you know what I’m talking about? They have the texture of Styrofoam but are REALLY addicting regardless. Wyatt’s vice? Butterfingers. And like clockwork, every time I polish off a bag of those puffs within 20 minutes, I get that disapproving look from Wyatt. And every time we take a walk to the gas station and he picks up a butterfinger, I have to give my ‘you are going to get THAT?’ comment. In turn, I just couldn’t bring myself to buy him a butterfinger for V-day. I could just imagine that ‘oh..you got me THIS’ comment when I handed it to him. So I made a Plan B – make my own. 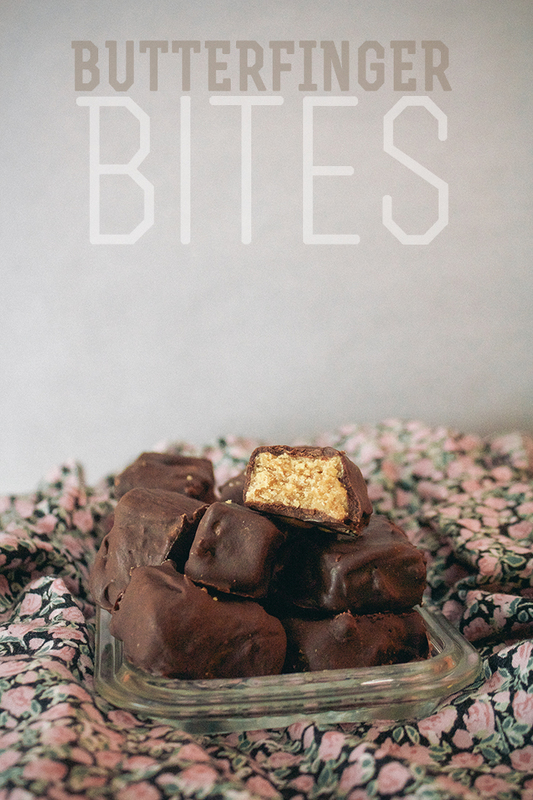 I have never really made candy before…mostly because I’m scared of the whole baking with corn syrup. But, after much research, I’ve come to the conclusion that corn syrup is NOT the same thing as high-fructose corn syrup that you find in packaged candy bars and that I will not be turning to the dark side if a put a small amount into a treat. These little bites turned out wonderful. I mix between a Butterfinger and a Reese’s cup…how could it be bad? You will need a candy thermometer for this because it’s super essential that you get the sugar heated high enough so that it hardens but not so much that it burns. Makes sense? Cool. Let’s get candy-making! Grease a 9×6 pan (I used my bread pan) and set aside. In a small saucepan, add the sugar, corn syrup, and water. Turn onto medium-high heat and let cook until the temperature reaches 290 degrees. While that temperature is rising, place the peanut butter, vanilla, and salt in a double boiler. Let water simmer under the bowl while the peanut butter creates a creamy, smooth paste. Remove the sugar mixture from heat AS SOON as it reached 290 and stir in the peanut butter mixture. Pour into prepared pan and let chill in the fridge for 30 minutes. Remove from fridge and cut into bit side pieces. Heat the chocolate and milk in a double boiler until melted and combined. 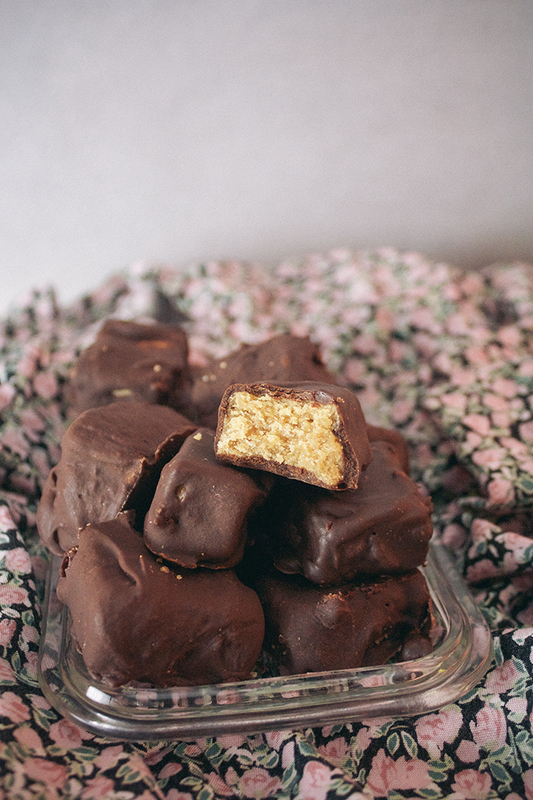 Dip the butterfinger bites into the chocolate and coat all sides. Transfer to wax paper and repeat with the rest of the bites. Let cool in the fridge for another 30 minutes. Enjoy cold or let them come to room temperature. this recipe looks great, but I was wondering if it really takes 11 cups of sugar? thanks! Oh goodness! What a terrible typo. It should be one cup! Thanks for catching that. Fixing now.